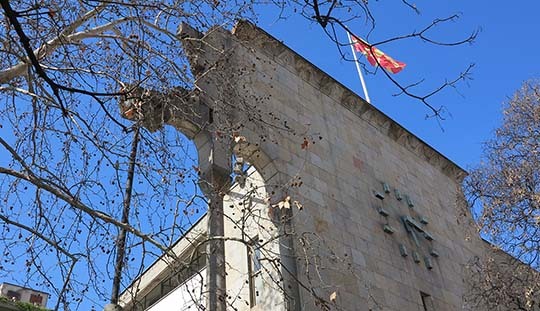 ▲ Stop two on my recent ‘continental European countries I haven’t been to’ excursion was Skopje, the capital of Macedonia. 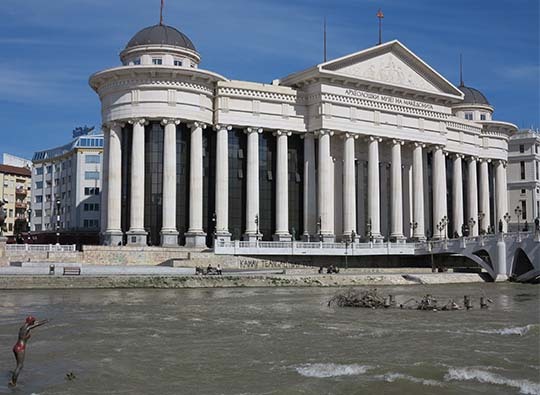 Skopje has two memorable facts, one is the terrible earthquake that totally devastated the city in 1963. On the front of the ruins of the old train station the clock is eternally stuck at 517 am, when the earthquake struck. I’d soon be travelling from the totally unmemorable new train station, taking the international train service to Pristina in Kosovo. 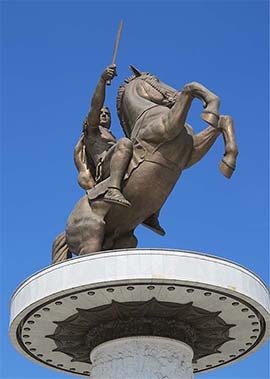 ◄ This huge statue topping a column in the centre of Macedonia Square symbolizes the country’s other memorable fact. It’s of Macedonian hero Alexander the Great, but Greece is absolutely opposed to the Macedonians making any claim on the conqueror of Asia so officially this is just ‘warrior on a horseback.’ Across the river is an equally anonymous statue of Philip II, Alexander’s dad. The Greeks are even more strongly opposed to Macedonia even calling itself Macedonia, that’s a name they want strictly reserved for the Macedonia region of Greece. Of course the Greeks haven’t got enough money to throw their weight around too much although their opposition is probably one of the reasons Macedonia hasn’t been able to join the Euro zone. ▲ Skopje is stuffed full of statues, you feel like somebody was required to plonk a statue down on any spare space and then when there were no spare spaces left they’d plonk one on top of buildings or bridge railings or … So many of them that you begin to feel an introduction to a Macedonian should be followed with the enquiry ‘and where is your statue?’ The ‘Bridge of Arts’ across the Vardar River features 35 statues (some of them just beyond the bridge) of heroes of Macedonian arts – singers, composers, artists, authors, poets, playwrights, educators even folklorists. Curiously the Macedonians couldn’t find any artistic hero, not even a humble folklorist, who also happened to be female so all 35 statues are of male Macedonians. Perhaps a ‘Female Bridge of Arts’ will follow in a few years? ▲ Never mind, there’s a ‘statue of a swimmer’ about to plunge into the Vardar just beside the old Stone Bridge and across from the new Macedonian Museum of Archaeology and of course she’s a woman, in a red bikini. She could then swim a few strokes downriver to one of the three concrete pirate ships eternally moored in this Balkan River. 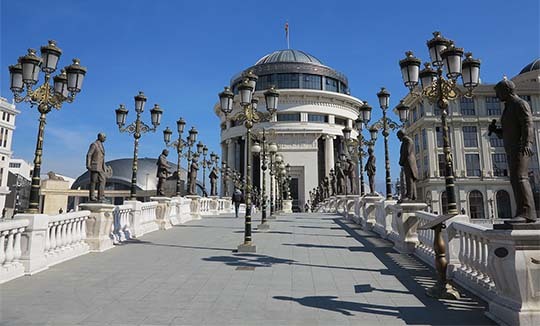 Like everything else in New Skopje – memorial buildings, monuments, statues and pirate ships – it’s wonderfully tacky, shonky, kitsch and looking like it’s not going to last very long. I was blown away by Ashgabat in Turkmenistan last year, a memorable cross between Pyongyang, Las Vegas and Dubai. Skopje could be Ashgabat on the cheap. ▲ I also found Skopje’s stray dogs memorable, they were quite friendly and unthreatening to humans. But every now and then they would take violent exception to a passing car and gang up and chase it en masse, barking and yelping as they surrounded it.